*No compensation was received for this post. A complimentary gift card and information about the promotion was provided. All opinions expressed are my own or that of my family. Yesterday was just one of those days. I hadn't planned anything specific for dinner...I should know better than to not plan out my menu for the week...so I sent my husband a text asking, what should we have for dinner. He sent back a suggestion that felt a little 'eh' about, so I said so. Then, he suggested CiCi's Pizza. I had been planning to suggest that for this weekend knowing that they were running their $5 Buffet special and because I wanted to get new pictures of the kids - the picture studio we use is next door to our CiCi's. I told him that we could do that, if he could convince the kids that we were going to do pictures before dinner. They agreed, so I made a picture appointment and our dinner plans were set. After the picture session, where the kids did better a job than usual of cooperating and getting through the session quickly, we headed next door to CiCi's. The line was out the door. Peeking in, we could see that the tables were mostly full and each time they cleared one, there was someone waiting to sit down. I wasn't completely surprised, they offer a good variety of pizzas on their buffet to appeal to everyone in the family, and in July, they are offering their buffet for just $5 a person (kids are cheaper - only $2.99, but that is the regular price). It was a reasonable night out, our total bill for the night was under $20. Not bad for a family dinner out that everyone enjoys. 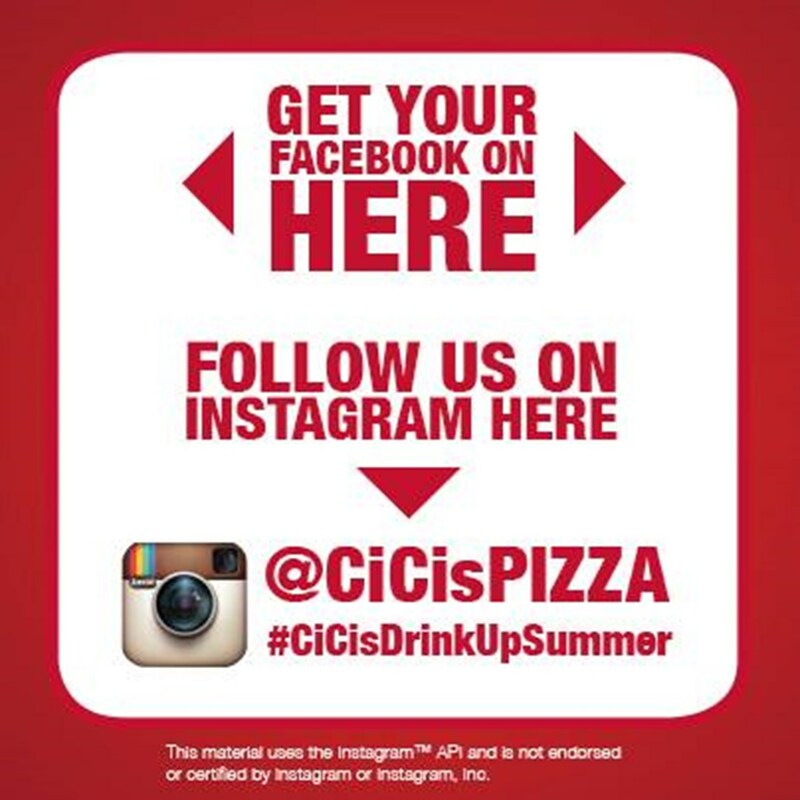 I don't have Instagram, but if you do you will want to check out CiCi's Drink Up Summer Promotion that is running right now. 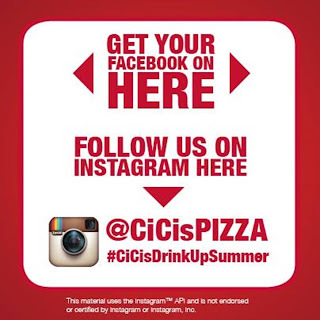 CiCi’s is giving fans the chance to win VIP vacations, grab instant-win prizes and get lucky with an Instagram contest. 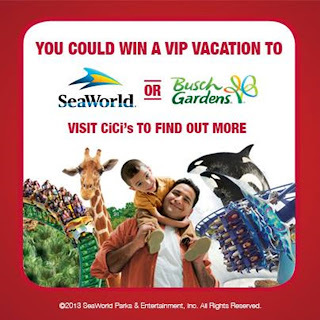 Guests can visit their local CiCi’s for details on how to win one of four all-inclusive VIP vacations, one-day passes to SeaWorld or Busch Gardens or $25 in CiCi’s gift cards. The contest runs through Sept. 1. In addition, throughout July, CiCi’s Pizza is offering its endless pizza, pasta, soup, salad and dessert buffet for just $5 at participating restaurants. No compensation was received for this post. A complimentary gift card and information about the promotion was provided. All opinions expressed are my own or that of my family. I have never been to CiCi's Pizza. There isn't one close to me which is a bummer $5 buffet for pizza is a great deal. my grandsons love cicis. the cinnamon rolls are a fav. Not only do my kids love the buffet but they love the game room too.